A campaign event Wednesday with black supporters of presidential hopeful Barack Obama included WBC welterweight champion Floyd Mayweather, whose achievements in the ring are clouded by battery convictions and accusations of domestic violence. Spokesmen for both the Democratic senator and the fighter sought to minimize Mayweather's involvement hours before the event was to begin. Shannon Gilson, a spokeswoman for Sen. Obama, D-Ill., said the campaign did not suggest that Mayweather not participate after questions were raised about his criminal record. She stressed that the 30-year-old fighter is one of many black supporters of Obama in Nevada. "He's simply a supporter. He's not on our steering committee. He's not an adviser to the campaign," Gilson said. 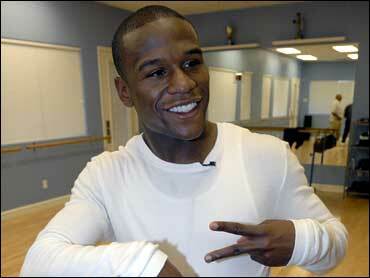 "We know Floyd Mayweather from his philanthropy and his work with at-risk children in Las Vegas schools." Leonard Ellerbe, Mayweather's top adviser, said the fighter planned to attend the event but that he was not endorsing Obama's presidential bid or getting involved in politics. He said Mayweather is "a great fan who admires the senator's tremendous accomplishments." Ellerbe added that Mayweather, who grew up in Grand Rapids, Mich., is a community leader in Las Vegas where he now lives and trains, attends many civic events and does philanthropic work. "All we're focused on is being positive - being the best citizen, giving back to the community, making a difference," Ellerbe added. In 2004, Mayweather was convicted of misdemeanor battery for punching two women at a Las Vegas nightclub the previous year. He was given suspended prison sentences, $1,000 in fines and ordered to complete impulse control counseling. In 2005, a jury acquitted him of a domestic violence charge, a felony, after his accuser, former girlfriend Josie Harris, changed her story. He also was convicted of misdemeanor battery for a bar fight in Grand Rapids.